Jim Anglea, Vice President – Sports Division, “teams up” with JEA HydroTech. 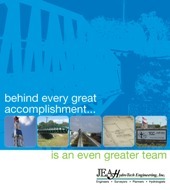 JEA HydroTech is pleased to announce the opening of our Project Office in San Angelo. "Kay and I cannot thank you enough for the outstanding solution you provided for our home stabilization. After spending a year in designing the home and another 9 months waiting for the construction to conclude, we were extremely disappointed to learn that we could not build the type of pool we desired, based on the “soil rotation” issue. You engineered a plan that not only allowed us to create the most beautiful backyard environment possible, but gave us the peace of mind that we would never have to worry about the house moving/shifting. Your attention to details, as well as your personal commitment to pleasing us was beyond our greatest hopes. Again, thank you for all you have done." "When it was decided to add a Garden event area to the Ruthe Jackson Center in Grand Prairie I did not hesitate in contacting JEA HydroTech to handle this project. As usual, they were outstanding in responding to our needs and giving us direction on this project."